Memory cards for high-end digital camera users are set for a massive increase in speed within the next 18-24 months. That's according to the creators of a new format called CFast, who are preparing to announce specifications for the new standard later in the year. 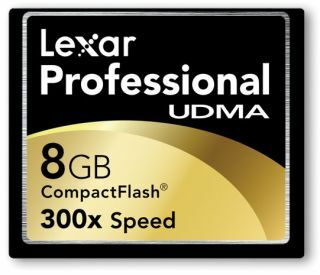 The new cards are being developed by the CompactFlash Association as a long-term replacement for CompactFlash (CF) cards. These are currently used in high-end DSLR models from the likes of Nikon, Canon, Sony and Olympus. Currently, the fastest CF cards can process information at 45MB/s. However, it’s claimed that the first generation of CFast cards will be able to operate at 375MB/s – about eight times faster. The higher speeds offered by CFast could be used to great benefit in future camera designs, particularly in situations when the photographer wants to take as many pictures in sequence as possible. With the CFast card able to accommodate data faster than has previously been possible, there would be less need for in-built buffer memory and the photographer would be able to record longer bursts. Of course, as with all new technology there’s a catch. The CFast interface isn’t the same as that employed by Compact Flash cards, meaning CF cards will not work in CFast slots and vice versa. You might want to bear that in mind before rushing out to buy a new top-end, CF-based DSLR in the next year.